I’m actually not a huge fan of candy, I love chocolate, but that’s not really “candy” in my mind, to me chocolate is the world’s #2 most perfect food item, tied only with bacon. Naturally the worlds #1 most perfect food item is chocolate AND bacon. Candy, is just something I’ve never been too crazy about. At Halloween I would usually consume all of the chocolate bars in the immediate weeks after, but the remaining candies would be left to become stale and inedible over time. So why would a non-candy person such as myself be interested in “Sweethearts” or “Conversation Hearts”? There were several factors, I wanted to work on a series of works to exhibit alongside my other works centered around the theme of “Love”. The conversation hearts were an excellent source of inspiration both with the sayings printed on them as well establishing a color palette to tie them together. The biggest challenge were the colors; I typically do not work with pastel colors! In particular I chose to base my color palette on the NECCO “Sweethearts” and used the sayings printed on the 2016 “Sweethearts”. 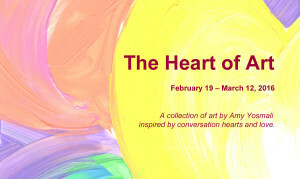 Although these works are not officially part of the January 30 Paintings in 30 Day Challenge, I have decided in the spirit of the challenge to share with you over the next 30 days 30 works I recently created, that were inspired by conversation hearts and their sayings from my art series, “The Heart of Art”. I invite you to like my Facebook page and to check back daily beginning January 21st, for a new post featuring a new painting and essay about this fun series.